As some in the Seattle area face the threat of deportation and prepare for the worst, a new sanctuary movement is arising among churches and other institutions to support and, if need be, shelter them. The 11-year-old remained calm as he listened to what would happen if the government took his parents away. That could be the case with this boy’s parents. Both came here illegally from Mexico. There was a space on the form to fill in who then would get custody of the child. Another form would have to be filled in for his 6-year-old brother, and two more to get passports for the children, both U.S. citizens, so they could reunite with their parents in Mexico. “A bit sad,” said the boy, when asked how he was feeling. He struggled to find more words, then broke down in tears. “It’s just chilling to realize families can get torn apart like this,” said Culbertson Moreno. With President Donald Trump’s new policies prioritizing millions for deportation, people who entered the country illegally are feeling an urgent need to get their affairs in order. And their advocates want to help. 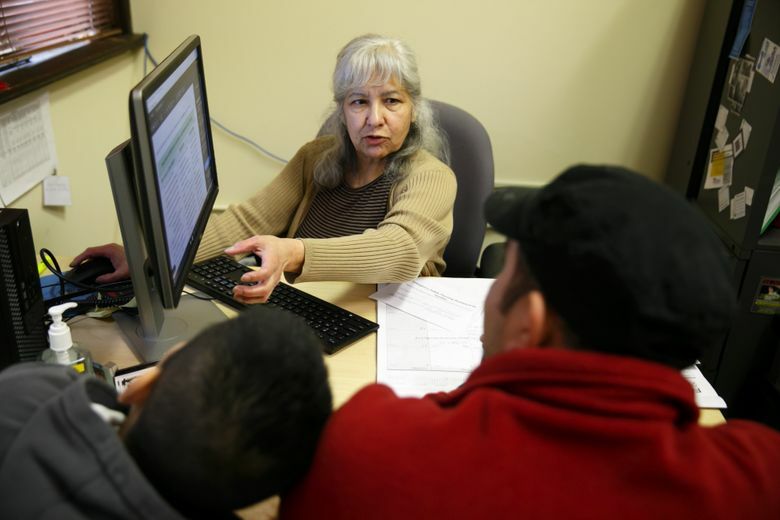 El Centro de la Raza, catering primarily to Latinos with services such as preschool and a food bank, is holding daily walk-in sessions like this one through March 4 to help people draw up emergency plans. Houses of worship are also preparing to step in, readying their buildings as safe havens. In Los Angeles, religious leaders are going so far as to form an underground network of private homes to try to hide families. In hopes of keeping immigration officials away in Seattle, El Centro last Thursday declared itself a “sensitive location” — a designation that immigration authorities use to refer to places where they will avoid enforcement actions. The locations include schools, which is why El Centro says it qualifies. U.S. Immigration and Customs Enforcement (ICE) spokeswoman Rose Richeson had no comment on El Centro’s self-designation. ICE does not maintain a list of specific locations but relies on general categories, which also include churches, hospitals, funerals, weddings and public demonstrations. Churches have played this role before. In the 1980s, a national “sanctuary” movement took hold, including in Seattle, among churches offering refuge to asylum seekers escaping civil wars in El Salvador and Guatemala. Amid stepped up immigration raids in the final years of the George W. Bush administration and the beginning of Barack Obama’s presidency, a new sanctuary movement arose. Trump promises a vastly expanded deportation effort, and that has provoked a reinvigorated commitment from the religious community. The Church Council of Greater Seattle has been reaching out to its 320 member congregations, as well as to local synagogues and mosques, to explore ways to support immigrants and refugees. That could include providing “long-term hospitality,” said Executive Director Michael Ramos. “This is all happening at warp speed,” said Thomason, explaining the church has to have more conversations about what that commitment would look like. He said the “hub” model entails working with other congregations and organizations that might provide a specific need, such as legal services. Saint Mark’s itself, a Capitol Hill landmark attracting some 800 people on a Sunday, is considering making some of its space available as a temporary home, complete with kitchen, laundry and showers, Thomason said. He didn’t want to say exactly where that home would be, for fear of attracting immigration officials’ attention, despite the church’s status as a sensitive location. In Auburn, Saint Matthew-San Mateo Episcopal Church, a founding member of the new sanctuary movement in 2007, also is gearing up to help. 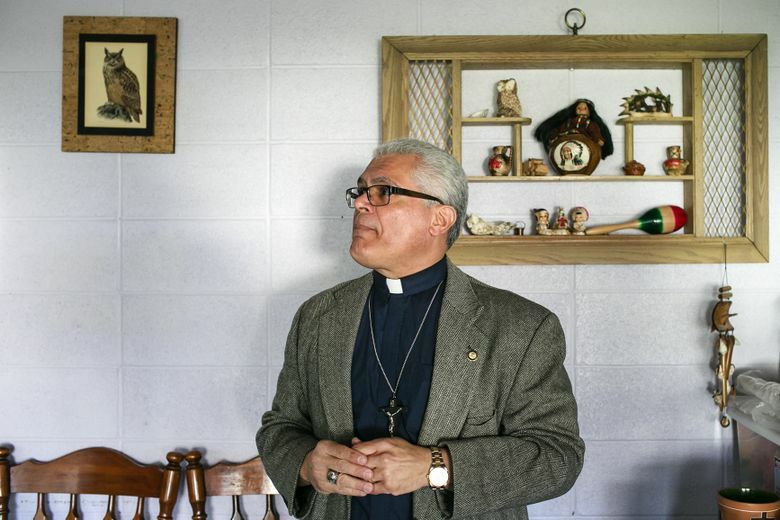 “I see no problems in hosting several families, if need be,” said Father Antonio Illas, the priest in charge of the congregation, which draws about 60 people to services, roughly half of them Latino. Illas is an unusual priest. He spent 25 years in immigration enforcement. Working first in New York and then in his native Puerto Rico, he investigated immigrants involved in drug smuggling. One of his parishioners is already hearing from immigrants in distress. Dianne Aid, involved in the last sanctuary effort through helping an Emerald Downs horse groomer swept up in an immigration raid, was contacted a few days ago by a mother who said if she’s deported, her young daughter would want to stay with Aid. Later that night, at 2 a.m., she started getting texts from her 23-year-old godson. He said he was so scared of immigration officials that he was hiding somewhere outdoors. At El Centro, 26 families showed up for the first day of emergency planning last Wednesday. By 10 a.m. Thursday, three families had arrived. The father of the 11-year-old said he had been in the U.S. 17 years, since sneaking across the border as a teenager. His plan was to stay a couple of years, earn money and return home, where he would go back to school. But he found opportunities too good to leave. He started a small contracting company, hired several employees, and last year, he said, paid $30,000 in taxes. If he and his wife are deported to Mexico, the plan is for the boys to live with cousins. Later, they would join him and his wife in Mexico. Education is better in the U.S., but kids need to be with their parents, he said. He and his wife have been talking about where in Mexico they might live. His home state of Michoacán is riven by violence from drug cartels. So he has thought instead of going to a safer, tourist area by the beach. Despite having plans in mind, he is so nervous about what could happen that he has sharply curtailed his routine. The family used to take a vacation every summer; his son’s favorite was a trip to Florida’s beaches. No more. “I go to the airport, maybe there’s more immigration,” the dad said. He similarly nixed the family’s once-a-week visit to a restaurant. “I’m trying to save money,” he said. A few weeks ago, he talked to his 11-year-old about the possibility of immigration officers showing up at their door. The sixth-grader has a cellphone, and his dad told him to use it to record whatever happened. “That’s very hard to explain to him,” the father said. Culbertson Moreno, the El Centro staffer, empathized. With a reminder that certain protections apply, she gave him another means of defending himself. She showed him examples of a valid and invalid warrant. Only the former would allow an agent to enter a home.